Noticing a high number of children street vendors, the Pacific Women-funded Samoan Women Shaping Development program (SWSPD) investigated. They discovered the underlying causes leading to children vending were poverty, unemployment of parents, and a lack of income to support large families. SWSDP responded with a project that is helping six families to increase incomes and return children vendors to school. Small business owner and start-up grant recipient, Mrs Salome Suliveta. Photo Credit: Samoa Ministry of Women, Community and Social Development. 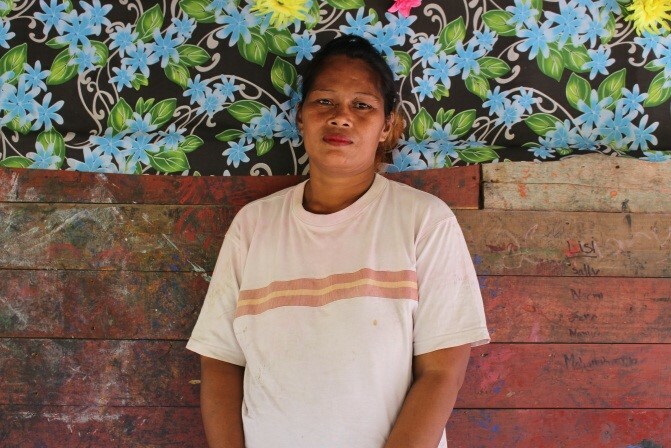 Ms Salome Suliveta is the mother of 14 children. Through her engagement with the SWSDP project, she received basic entrepreneurial and business management training and was supported to develop a business plan. Then, with a start-up grant, she opened an elei fabric printing business. This has grown and she is now also running a small canteen from her home. The terms of the grant were agreed between Ms Sulivata and SWSDP in a memorandum of understanding. Tools and resources that Ms Suliveta had identified in her business plan as necessary to start her enterprise were funded through the first disbursement. The final disbursement is subject to Ms Suliveta fulfilling the requirements in the memorandum of understanding. As a result of support provided to these six families, 22 children have now returned to school. This includes some who had dropped out as young as eight to help earn income for their families.